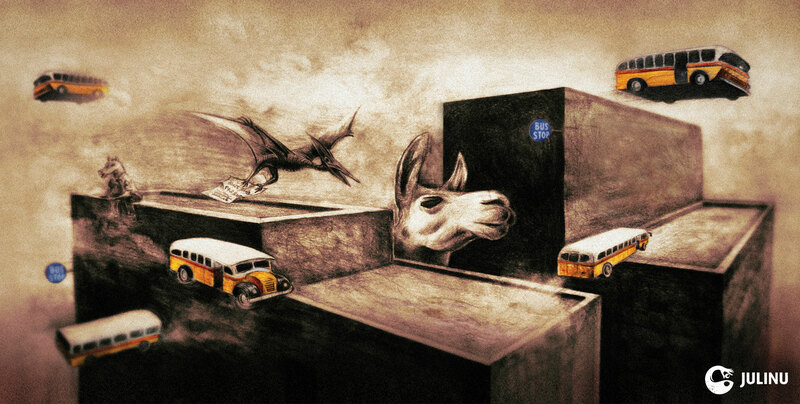 Move Back is an illustration that was created as part of the packaging for a CD track featuring an assemblage of sounds – in the tradition of Musique Concrète – related to public transport. Given that the situation of the public transport system at the time was laden with chaos and inefficiency I decided to reflect this in the cover illustration. Hence the exaggerated, absurd, post-apocalyptic, barren, polluted environment with giant llamas and pterodactyls roaming about freely. One might be interested to know that “Move back!” was a phrase typically shouted by frustrated bus drivers to passengers clogging up the front part of the bus to avoid occupying the back seats. Pencils on Paper and Digital.